The Multihull race circuit world is a crowded place. The long running Extreme Sailing Series™, tagged as the ‘original & global Stadium Racing series’ has been joined by some high-flying rivals. Back in 2005 TornadoSport, with designer Yves Loday, developed the 40-foot Extreme 40 catamaran. This radical design debuted with close action sailing during several stopovers of the Volvo Ocean Race in 2007, instantly attracting public and media attention. For 2008 OC Sport made an agreement with TornadoSport to develop Series and the iShares Cup was born with four European destinations: Amsterdam, Munich, Marseille, and Cowes. 2008 also saw other new developments when Ernesto Bertarelli’s two-time America’s Cup winning team Alinghi won the Extreme Series, and in 2011 with the circuit now including events in Aisa and the USA, Ben Ainslie joined the circuit at the helm of Oman Air. While over in the America’s Cup world, dramatic events in Valencia saw a one-on-one Deed-of-Gift match take place in 2010 in giant multihulls, won by the rigid-wing trimaran of BMW Oracle Racing. The die was cast and in 2013 the AC72, a wing-sailed catamaran was introduced for AC34 together with a new pre-series using one design AC45 class boats in various world venues in 2011 and 2012. By the time of the 2013 Cup in San Francisco the teams were hydro-foiling the AC72s and the emphasis was on completing a complete race on the foils. In the final match series between the USA and NZ the Golden Gate YC made an improbable come-from-behind victory. They won eight straight races to defend the cup and beat New Zealand 9–8, and made big multihull foiling a world-wide sensation. The next America’s Cup, won by New Zealand, took place in 2017 in Bermuda raced in a smaller foiling catamaran, the AC50, and again with pre-events in the foiling AC45s during 2015/16. With all the media attention now focussed on foiling multihulls, in 2016 the Extreme Sailing Series replaced the Extreme 40 catamaran with the foiling GC32 catamaran, and the World Match Racing Tour switched from monohulls to the M32 catamaran. 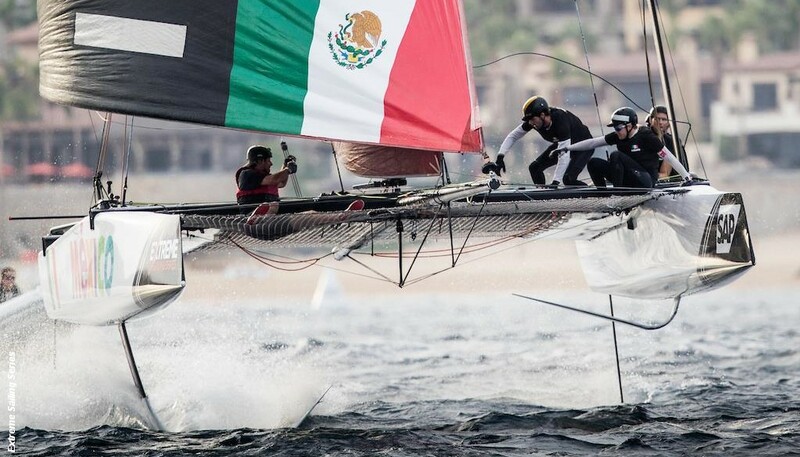 Olympic Sailing was not immune to the foil phenomena and the recently introduced (Rio2016) Nacra 17 catamaran made a quick switch to foiling mode, the rapidity of the change leading to some teething problems, but obviously hoping to attract media attention at the Tokyo2020 Games. While all the foil attention has been focussed on multihulls, the AC36 defenders Emirates Team New Zealand, decided to bring the next Cup match in 2021 back to its roots, but with a twist, they proposed a foiling monohull, the AC75. The AC75 is a fully foiling monohull without a traditional keel for stability, instead it has two canting, ballasted T-foils to provide righting moment and apparently the ability to self-right the boat in the event of a capsize. As with the recent AC events it seems that the ability to be able tack and gybe on the foils and minimising time sailing in ‘low-rider’ mode will be key to winning the next America’s Cup. The new kid on the multihull block is the Coutts/ Ellison SailGP circuit using rebuilt AC50 multihulls (good recycling credentials) to provide a professional International one design series. Starting with six national teams and five events but intended to grow. Again, extreme speed in a relatively restricted area is the hook for pulling in the punters and attracting media coverage. Given the right conditions, it is expected that the F50s will reach speeds in excess of 50 knots. The final SailGP event in Marseille will differ slightly in that it will be a three-day event comprising a series of races, followed by a final race between the two highest ranked teams for USD $1 million. One thing that has become apparent to me with the advent of regular racing in foil-based boats, is that after the initial novelty of the speed differential, is that it can be surprisingly boring watching high speed straight-line racing. And as with Formula 1 Car Racing, the only excitement or place changing occurs when things go wrong. Thus, the media highlights featuring those moments come to represent the sport. Not that this will stop the continued advance of foils on everything that floats or their popularity. Whether that results in a new audience for sailing as a competitive sport remains to be seen.